Starbucks Corp. posted quarterly profit that rose 35 percent on higher prices. The retailer lowered its sales and earnings forecasts after U.S. customer visits fell, sending the shares down 8 percent. 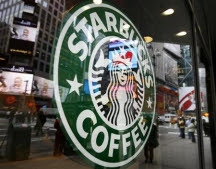 Starbucks lost customers after a 9-cent-per-cup price increase in late July caused consumers concerned about higher food, fuel and housing expenses to go to McDonald's Corp. or Dunkin' Donuts LLC stores instead. Let's face it, folks. It comes down to Annie's Bottom dollar, right? And nowbody wants to pay higher prices. So, let's hope milk prices drop and prices generally drop a bit so that instead of paying 4 whole dollars for a Venti Macchiato, we could all pay a measly $3.98. Because, $3.98 is just so reasonable for a cup of coffee, as my folks put it. Decadence, Starbucks customer, is thy name! Yeah, guy's got to take a second job to keep up the caffeinated habit. I don't care for their food, though. They should stick to the drinks. I share your predilection. It's no place to masticate but it sure delivers in their beverage department.